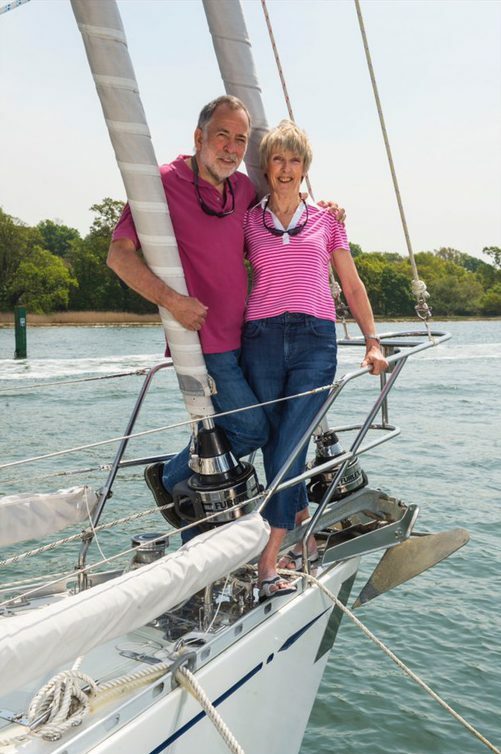 Musetta of Hamble – A Blue Water Odyssey with Alan & Ros King! A Blue Water Odyssey with Alan & Ros King! Alan and I met in 1998 and soon after discovered our mutual passion for sailing! 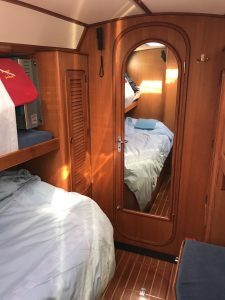 We progressed from sailing our Laser 11 dinghy to several bareboat charter sailing holidays in the Caribbean. Sheer luxury but we realised that in order to progress we really needed to have a boat of our own. In 2004 we bought our first cruising yacht. 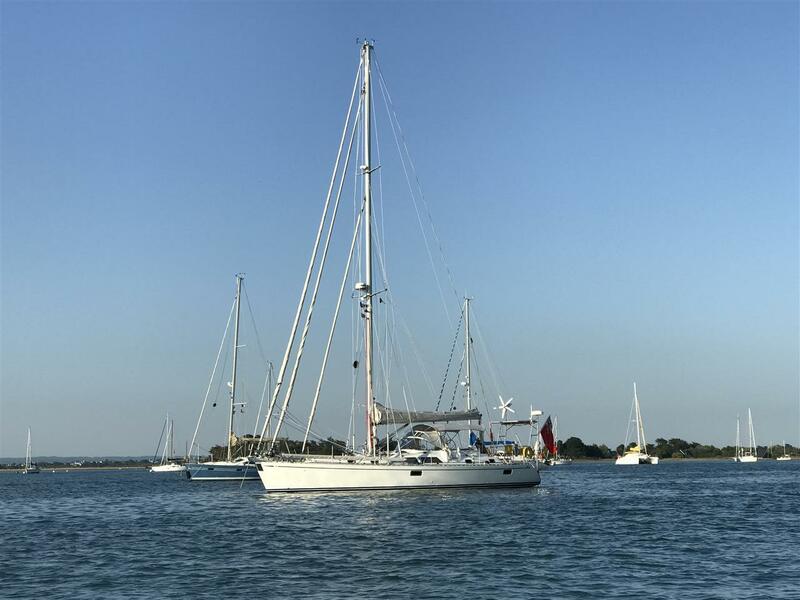 She was made in France and was an 8.8 metre, 29 foot Jeanneau Sun Odyssey 29.2 named ‘Imshi 111’. She was ideal as our first yacht and taught us a great deal. We grew very fond of her. 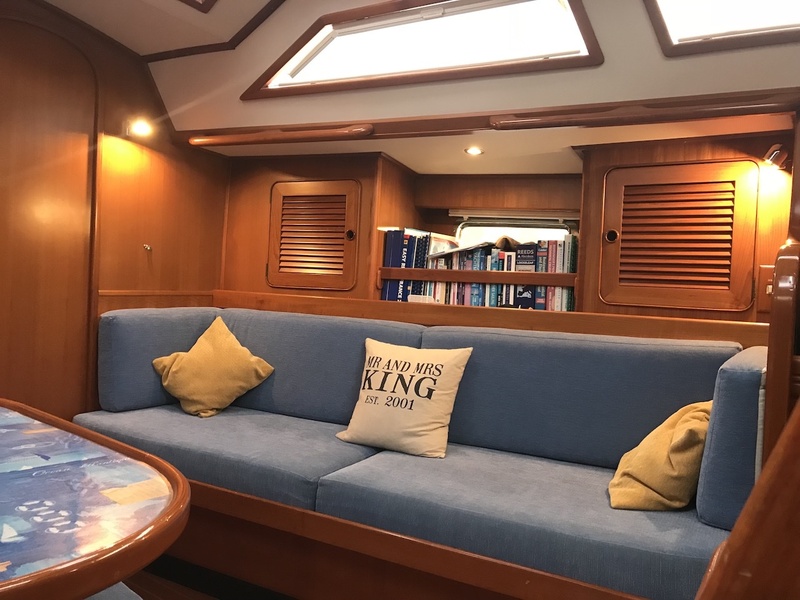 We also decided then that a little more comfort was required, so we looked further afield, Flensburg in the north of Germany to be precise where we found our next boat! After four seasons with ‘Imshi 111’ we bought an 11 metre, 36 foot Swedish built Halberg Rassy 36 which we called ‘Musetta’. Her German owners were having a new boat built and wanted to keep the name they had given her thus we had a good reason to choose a name for her ourselves! 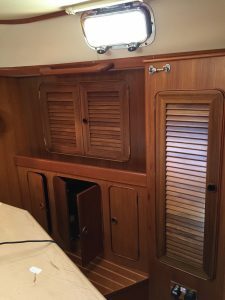 A) In memory of my father who had a great love of the sea, owning three cruising yachts himself, and although he didn’t live to see her he knew that we wanted to buy her. He was the Principal of the trumpet section in the Orchestra of the Royal Opera House, Covent Garden for many years and in that role performed Puccini’s opera ‘La Boheme’ on many occasions. Musetta is one of the female characters in that opera. B) Plus – we like the name!! We became the owners of a new boat, a 14 metre, 46 foot Hylas which just happened to be for sale at the time. 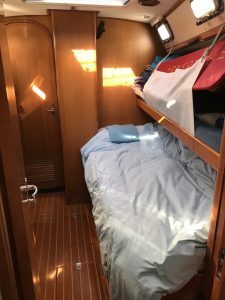 We had had a test sail on one of these boats before we owned Imshi and had noted that it would be a likely contender for our third boat as she sailed beautifully! Here she is alongside in Royal Clarence Marine, Gosport. The buyers of our Halberg Rassy wanted to rename her and so once again we were in control of the name of our boat. She is called ‘Musetta of Hamble”. 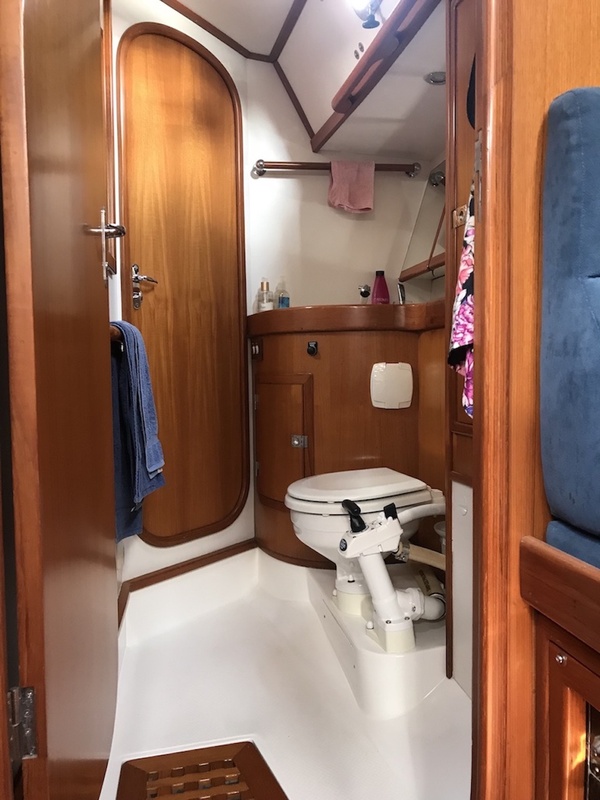 She is a Hylas 46 Built in Taiwan at Queen Long Marine in 2001 – Hull No 37 . Hylas yachts are built mainly for the American market. Ours is one of the few found in the UK. Coincidentally our Rassy and our Hylas were both designed by the Argentinian naval architect, Germán Frers. Musetta, new to us in April 2012, although just the sort of boat we were looking for did require a major refit to ready her for our big trip! This has taken us several years but of course we have been working in between times doing our day jobs. 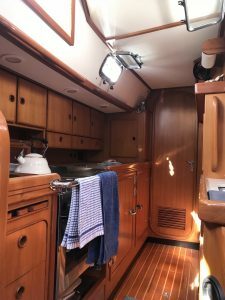 We have been getting to know her, cruising to Normandy, the Channel Islands and the North Brittany Coast.We have also had a lot of work done to her, doing much of it ourselves during her winter lay ups. 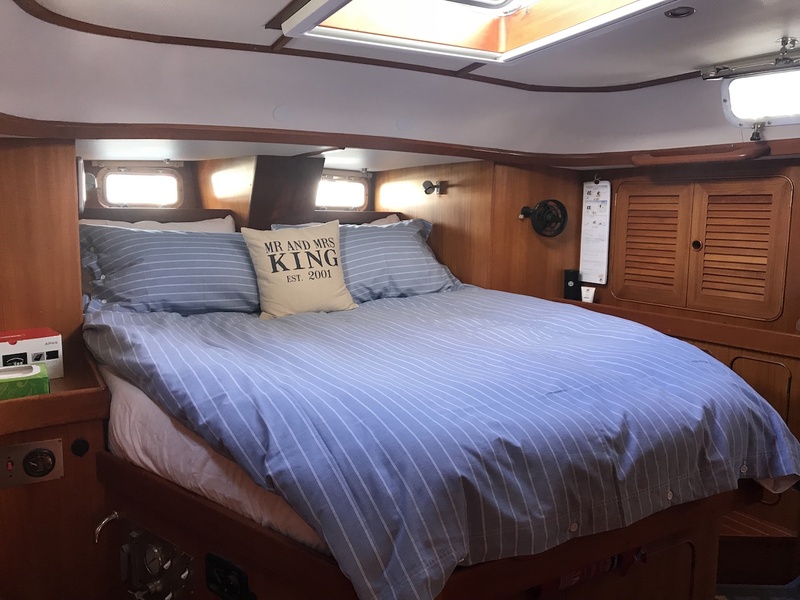 She is a beautiful boat and sails very well and after three seasons of getting to know her we are ready….! Well as you all know that wasn’t quite true but as you also know we left in May 2016, only a year late! 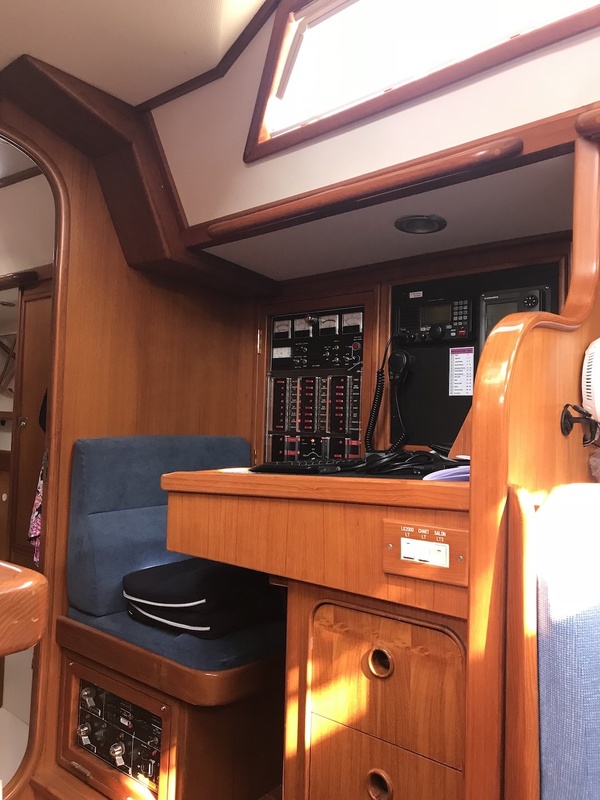 We have added a stainless steel arch at the back of the boat with three 100 watt solar panels which have maintained the batteries at 100% or close to ever since! On the arch we have the various aerials for electrical equipment on board, a wind generator and an Iridium pilot for satellite communications. 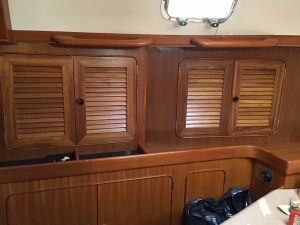 A Tour of Musetta’s interior! It takes a while when you first buy a boat that you intend living on to discover what works for you? 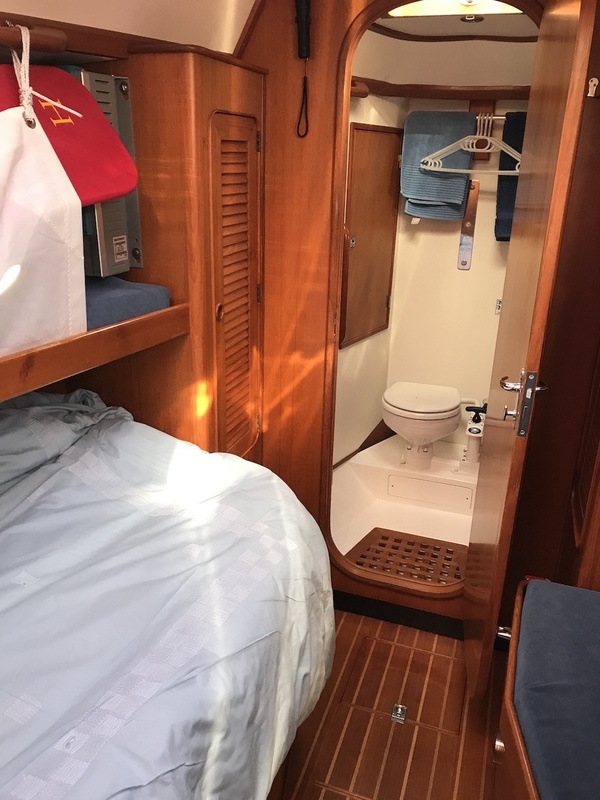 Here are some photos to show you how we live on the boat! We think we are very lucky and while compromises have had to be made, we hope that we have come up with the right set up for us! 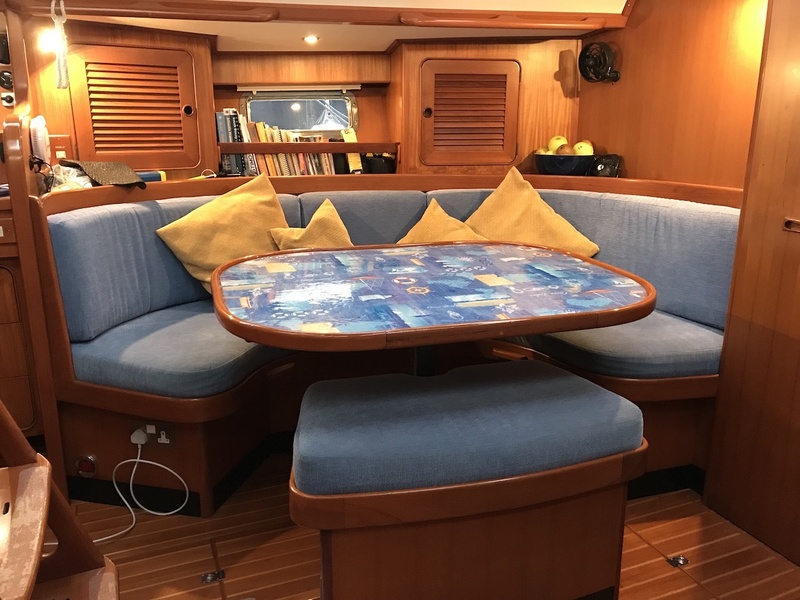 We refurbished the cushions and reshaped the berth/settee on the starboard to make it into a sea berth while on passage! The newly reshaped starboard seat and sea berth! The port hand seating area and table. All the cushions have been refurbished but the original shape remains! 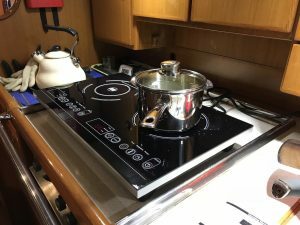 A new addition to the galley equipment ~ an induction hob which is not only fast and efficient it saves us using our gas bottles while in port! We have yet to try it on passage with the inverter? We had new mattresses made to replace the very minimalistic original ones which have made it much more comfortable! 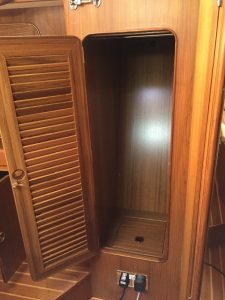 We also had some joinery work done in the form of new lockers to store clothes and much more!! They were beautifully made and matched the original wood work perfectly. We are really pleased with our ‘acres’ of more storage! I was going to say, no change here but remembered the unexpected shower we got as we accidentally brushed past the very badly placed shower fitting nearly every time we went into the heads! The shower fitting is now integral with the basin taps! The shower fitting had the same treatment as the aft heads and a new hanging rail behind the loo! This is a Yanmar 75 HP and is brilliant! Alan has fitted new alternators, this rather than investing in a generator which we are told, and have heard, can be extremely unreliable. He also said that all ships engines are given a name and so he named ours ‘Lady Rosalind’!!!! The Engine alias ~ Lady Rosalind! 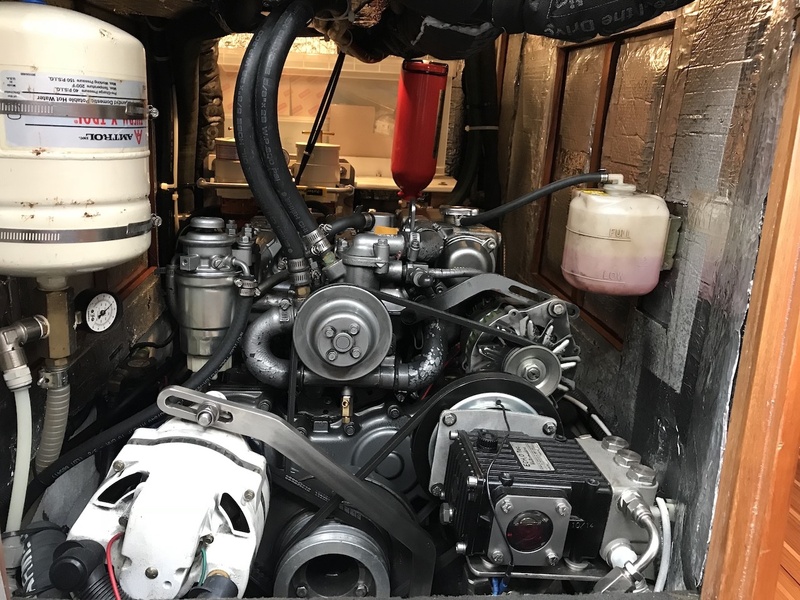 A seasoned yachtsman with several Atlantic crossings under his belt and who shared our mooring on the River Hamble said the best piece of advice he could give us was to invest in the engine. This we have done and so far everything is running smoothly! 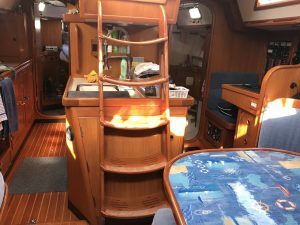 Access to the engine is behind the companionway steps!